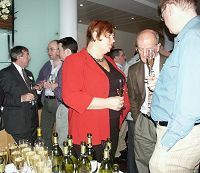 superBOWL 2002 was a national “off-line”; a gathering of wine nuts who meet on the UK Wine Forum, part of wine-pages.com. The event was a celebration of wine. This was a non-commercial event, and most of the wines – rare and expensive – were brought along by the attendees, who had raided their cellars to turn up a special bottle or two they wanted to share. On the evening before superBOWL, a pre-event wine dinner for a dozen early arrivers took place in Glasgow at the Ubiquitous Chip restaurant. Notes for the wines are available here. The afternoon session of superBOWL itself was centred around an amazing walk-round tasting of an absolutely fantastic array of fine wines. You can read tasting notes on all 60-odd wines, compiled by several superBOWLers, by clicking here. After a short break when many superBOWLers relaxed in Glasgow’s late sumer sun, the grand dinner began, accompanied by Champagne and fine wines donated by a range of sponsoring companies (right: the crowd assembles for a glass or two of fizz). During the evening there was also a raffle, which raised almost £200 for Wine Relief, a registered charity associated with Comic Relief, and the results of that afternoon’s mystery wine competition. Notes on the dinner are available here. superBOWL 2002 really exceeded all my expectations – what a wonderful celebration of a mutual love of wine, and what a nice set of people – it was fascinating putting faces to “cyber” names, and meeting up with old friends (make sure to visit the photo gallery). The event sold out very quickly, and I have no doubt that superBOWL 2003 will be even bigger and better. There was a tremendous buzz about the day, with people travelling from every corner of the UK, as well as Europe, to attend. It was also a milestone for the wine-pages.com web site. As a totally independent site, I am delighted that 60 wine nuts were so keen to attend, and look forward to welcoming them to Glasgow again next year. Finally, my thanks to all the individuals who gave time and effort so generously on the day: leading the seminars; supplying 450 tasting glasses; carrying wines; pouring wines; selling raffle tickets and on and on. And my thanks, of course, to all the superBOWLers!